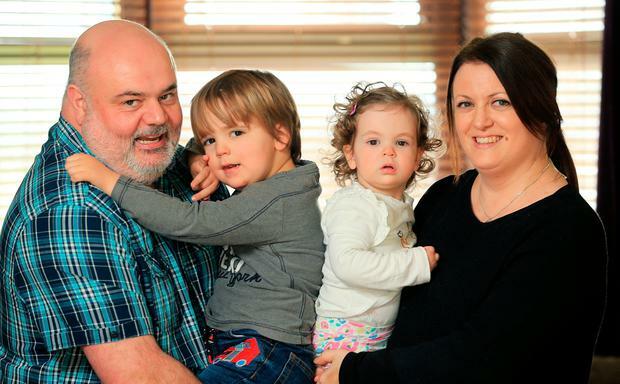 Like thousands of parents, bank worker Helen Rooney (40) and her partner Colm Cox juggle their jobs and childcare on a daily basis. They have sat down and done the sums, tried to work out if one of them staying at home would work - but in the end have found they both have to work to keep their heads above water. Their son Lucas is three years old and their daughter Olivia is aged 19 months. "I do the hours of a five-day week squeezed into four days, so Lucas and Olivia are in a crèche for those four days, but even at that our childcare bill is around €1,500 a month - and that includes a sibling discount in the crèche," Ms Rooney told the Irish Independent. "It's bigger than our mortgage, but neither I nor Colm, who also works in banking, can afford to give up work. "It just feels like we are on a treadmill. I get up at 6.15am to get ready, we all leave the house by 7.30am and drop the children off at the crèche before we arrive in work for 8am. "Colm tries to get out at 4pm because he starts work early. Then because I'm working the five-day week over four days, I'm in work until after 5.30pm. I get home around 7.30pm and try and have some time with the kids. "It means that by the time the weekend comes we are exhausted, but we just have to keep on doing it." A survey on behalf of Seas Suas, the representative body for independent providers in the early education and childcare sector, found that 30pc of parents could not attend work or missed out on job opportunities due to lack of childcare. It also found that more people make their childcare choices based on how it hit their budget, rather than on the reputation of the person who would be minding their children. Seas Suas chairperson Regina Bushell said: "For working parents, affording childcare is one of the biggest challenges they face and this situation is made all the worse by the underfunding of the sector by successive governments." Ms Rooney added: "I think that more needs to be done in order to make childcare affordable. Finding childcare for us wasn't too difficult, but the cost is the pressure. "We are squeezed - definitely. "I have heard that in some countries childcare is no more than €300 a month." Lucas will be starting school in September and the Early Childhood Care and Education Scheme takes some of the sting out of the childcare costs. But Ms Rooney knows that even when he starts school, they will still have to come up with the money for after-school care to cover the time between when school finishes and either parent gets to pick him up. "People tell us it doesn't last forever and that things will get better," she said. "But childcare is a big financial burden that is affecting so many families."